Dublin’s best kept secret is out of the bag! For our “secrets” themed night, we had one of the most packed, raucous, enjoyable nights so far! 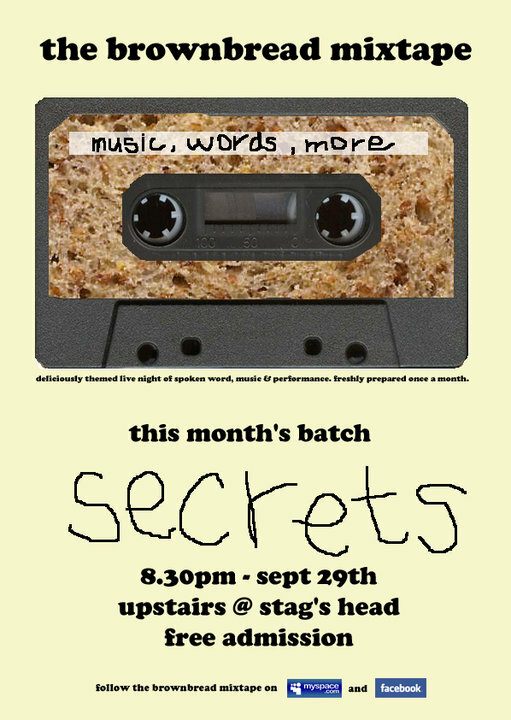 Thanks to every last one of you for coming to the Stag’s Head for yet another astonishingly fun brownbread mixtape. It was an energetic, vibrant house full of fans and we had a healthy gang of folks tuning in online too. We really appreciate your incredible support. As always, massive thanks also to all the incredible performers who delivered remarkable performances on the brownbread stage. Below are YouTube clips of all of the performers on the night, as well as some of the other mad moments (I’m looking at you Jeff Nelson). If you like what you see, pass on the link on your Facebook page or some other social network you’re connected to. We are really hoping to invest more time and energy into our YouTube channel but we need to know that it is being watched. We urge you to subscribe now. Over 70 videos of original content on there already including brilliant music, sketch comedy and poetry. We need your help to spread the word! The sublime Secret Gospel Choir gave us a gorgeous rendition of the Billy Ocean classic “Get outta my dreams, get into my car”. Seductive, sweet voices and heavenly harmonies. They will not be a secret for long with skills this superb. Then Kalle shared his frustration, anger and less-than-secret feelings about the failures of the government, banking institutions and property developers in a poem shaped call-and-response interaction. Warning: Contains language almost as bad as the government’s leadership skills. We closed out Side A with a story from the wonderful mind of Colm Liddy. Equipped with little more than some printed pages and an orange t-shirt emblazoned with “True Dat”, he took the audience on a wonderful journey through the highs and lows of being an erstwhile champion dad. His wonderful book 40 Fights between Husbands and Wives, published by Penguin, is available for purchase now. The Lonely Schizophrenic then delivered a trademark cheeky, hilarious, singalong set of songs. They even managed to squeeze in a tribute to Jeff Nelson at the end of the song. One of the most entertaining bands you are likely to see. Make it your duty to see them! The Brownbread Players returned with a wacky Python-esque sketch about two auld biddys chatting to the local priest about the secrets and mysteries of God. Really funny stuff. The final act of the night was a remarkable band from Manchester called Rook and the Ravens. Gorgeous three part harmonies, wonderful lyrics, brilliantly blended guitar lines and truly genuine guys at the helm. These guys are deservedly garnering huge praise for their monster talent. Do yourself a favour and buy anything they release and catch them anywhere they play live. Their future is big and that is no secret any more. And so another month blazed by in a blurry brilliant bound. Thanks to all of you who continue to support the night. It fills our hearts with joy! This month we have TWO batches of brownbread! The theme for both is “Imagination”. The first show is on Oct 27th in our usual haunt, The Stag’s Head. The second show is part of the Imagine Arts Festival in Waterford on Oct 31st in the wonderful Downes Bar (makers of the legendary #9 whiskey) We have an astonishingly good line-up for both nights, so please spread the word!